A living, breathing, snuffling pig snout feels like nothing else I have ever before touched, except maybe a football (aka “pig skin”). 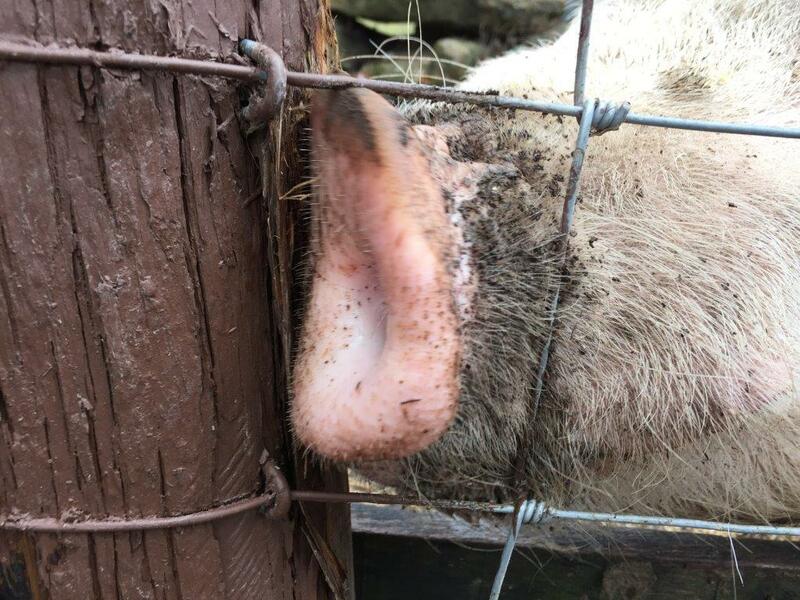 Pigs also have long eyelashes that you can see when you get close enough to scratch their snouts which they seem to love given their vocalizations. Pigs are very social and quite curious and , and there are many affable pigs at Catskill Animal Sanctuary (not the defunct Catskill Game Farm), including 11 Yorkshire piglets, some full grown Yorkshires, a couple of adult Spotted Pigs (that’s what they’re called)–all commercial breeds genetically manufactured to reach over 1,000 pounds each (“normal” weight is half that). There are some Asian Pot Bellied Pigs, too, not raised here as food animals but as pets that outgrew their NYC apartments. I stopped eating cows and pigs in 1974 and rarely ate them before that. As soon as I left for college, I stopped eating “food” mammals of all kinds: pigs, cows, fowl, and fish. I never liked eating meat anyway as a kid, often hiding it in my napkin and then throwing it away. My mom was raised on a cattle farm in Nebraska, so we always had sides of beef and pork in the freezer, and they appeared on the plate every night. Consequently, my vegetarianism was alarming to my parents and not quite as common, or easy, as it is today. I gradually added fowl and fish back into my diet around 1980, mainly due to laziness on my part and the unavailability of vegetarian food in most groceries and restaurants. Over the past year or so, I have reluctantly eaten both fish and fowl. I continued to limit what type I would eat–humanely raised, or “happy” animals as I called them, line-caught or wild fish. Even that qualification has been bothering me. I know that the dairy industry fuels the veal market, a reality that is hard to reconcile for me, as I’ve never had the heart to even sample veal. I knew it was a major issue that I had to address head on. Not only did it feel like a dietary decision, it started feeling more and more like an ethical issue for me. I was moved meeting Audrey and Mario, two pigs who now live at CAS, donated by Bob Comis. I have read about Comis, an Upstate New York pig farmer who, although a free range “humane” farmer, could no longer live with raising pigs for slaughter. He gave away his pigs, in pairs, documented in the upcoming film, “The Last Pig.” He is now a vegetable farmer. One unusual feature of CAS compared with most other farm animal sanctuaries (e.g., Woodstock Farm Sanctuary, The Farm, the Gentle Barn) is that you can stay overnight on the property, at the Homestead–a beautifully restored 1813 home. As a member of CAS, you can pay to stay in one of three rooms named after three of the more notable animals that lived out their lives at the Sanctuary–Paulie, Rambo, and Dino. I stayed in Paulie’s room (rooster). The vegan breakfast was delicious, and I met the other visitors, a daughter (UVM professor) and her mother; they were celebrating the mother’s 82nd birthday, and I have maintained contact with them. I even took my dog, Katie, along although she had to stay at the house during the farm tour. By the time I returned, she had been fully incorporated into the house activities and was invited back anytime. I know the next step in the journey is to become vegan. I plan to experiment with that choice, much as I did with becoming a vegetarian again – a little at a time. Given the travel I do as part of my work at PRA, I will have to see how accommodating the world is for a vegan diet. In the meantime, I try to buy only eggs from free-range chickens and milk and cheese from happy cows and try to live with my discomfort and conscious contradiction. I love (finally) reading your account of your visit to CAS where I volunteer, AND the fact that you chose CAS for your retreat, Lisa ! PRA is so fine ~ giving time for this kind of reflection for employees. Weekend tours happen from April through October. A valley sanctuary of rescue and compassion.